AUSTIN R. PICK was born in North Carolina and has traveled widely while cultivating a commitment to contemplative practice and a love of the world’s wild places. Austin's writing has appeared in The Arrow, The Stockholm Review, Epiphany, Tahoma Literary Review, Pleiades, Adbusters and elsewhere. He served as contributing editor of Along the Path: The Meditator's Companion to the Buddha's Land, a dharma travel guide published by Pariyatti Press in 2009. 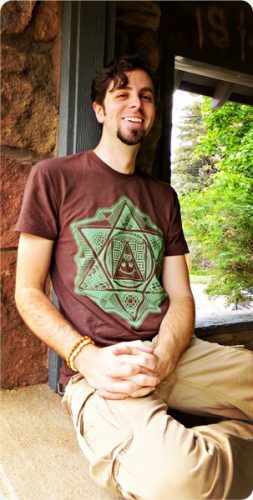 Austin holds an MA in Religious Studies from Naropa University, where he has been on staff since 2014. Austin's passion for contemplative practice and inventive language reflects his dedication to developing an ever more conscious engagement with our ongoing composition of the world—one that is expansive, inclusive and compassionate. He lives in Colorado with his wife and their intrepid dog Matcha. Site images by Austin R. Pick unless otherwise noted. Illustrations by Jsun Adrian McCarty (1980-2016). In Memoriam. FudoMouth.net began as a collectively-spirited space for creative exploration, and once hosted a selection of wisdom texts, as well as travel dispatches, collaborative writings, and various projects, some of which can still be found here. I first encountered Fudo in Gary Snyder’s The Fudo Trilogy, a slim collection that includes the incomparable “Smokey the Bear Sutra.” A few years later, I met Fudo again in the temples of Japan. Fudo has served as FudoMouth’s patron deity and guardian since the site’s inception in 2006. Fudo (Fudō-Myōō), "The Immovable One," is the Japanese incarnation of the Buddhist deity Acala and the central figure of the wrathful guardians known as the Vidyaraja or Wisdom Kings. In contrast to the serene images of Buddhas and Bodhisattvas, the Vidyaraja are ferocious and menacing. Their fearsome postures and contorted grimaces convey the force with which they work to dispel ignorance. 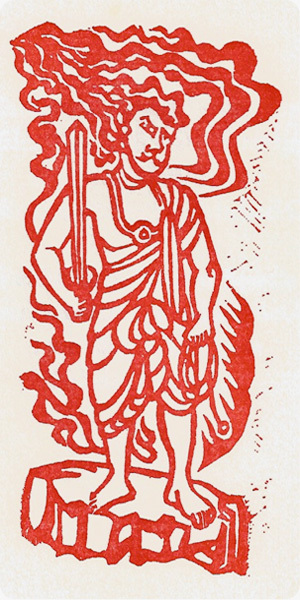 Fudo carries a rope for binding demons and a sword for dispelling delusion. From his mouth protrude two fangs, one pointing down, showing compassion for suffering beings, and one pointing upward, showing commitment to enlightened wisdom. Engulfed in flames, Fudo conveys the ability to transform anger into awakened energy, and is immovable in his commitment to aid those seeking liberation. 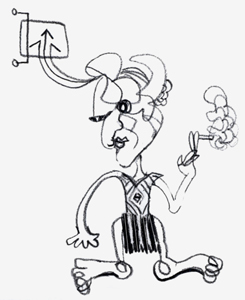 "My nourishment is refined from the ongoing circus of the mind in motion. Give me the odd linguistic trip, stutter and fall, and I will be content."